On Friday 5th May, we took another major step forward with our LCC 1 restoration project, as we had air going through parts of the system of pipes and valves for the first time in over 50 years! Over the last few months, members of our workshop team have been working hard to untangle the system of pipework that the tramcar has. No easy task when we don’t have any original drawings to work to. 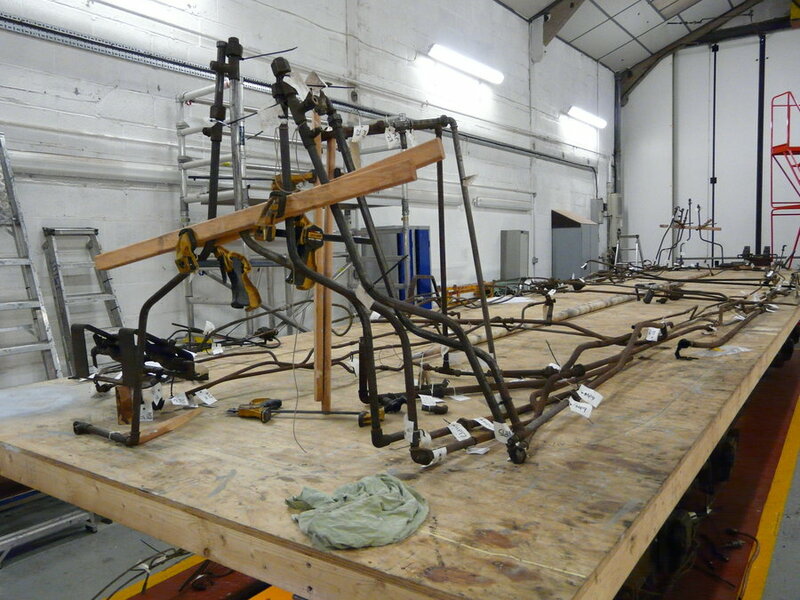 The work has therefore involved using the original pipework that we removed during the deconstruction phase of the project, as a giant 3-dimensional drawing, but also working out modifications made when the tramcar ran in Leeds. 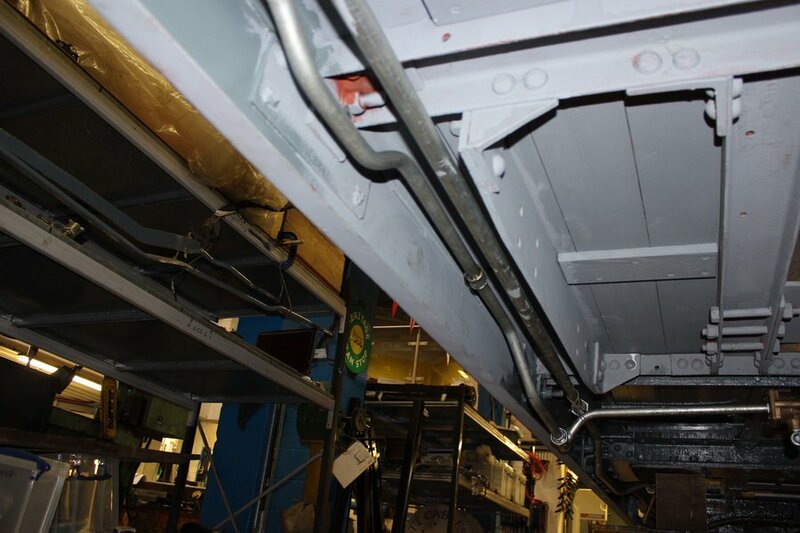 The photo above shows the original pipework that we removed from the tramcar. We’ve laid it out so we can refer back to it as we install the new pipes and valves. You might be wondering, if we have all the original pipework, why are we replacing it. When we removed the pipework originally, we had a close look at the condition of it, and were concerned that some of the pipework might have deteriorated and corroded inside the pipes and we couldn’t be 100% confident that it would function as it should do if we reused it. We therefore took the decision to replace the whole system of pipes with new ones, so we would be sure that there wouldn’t be any problems with the system and that this part of the restoration would be our restoration specification. 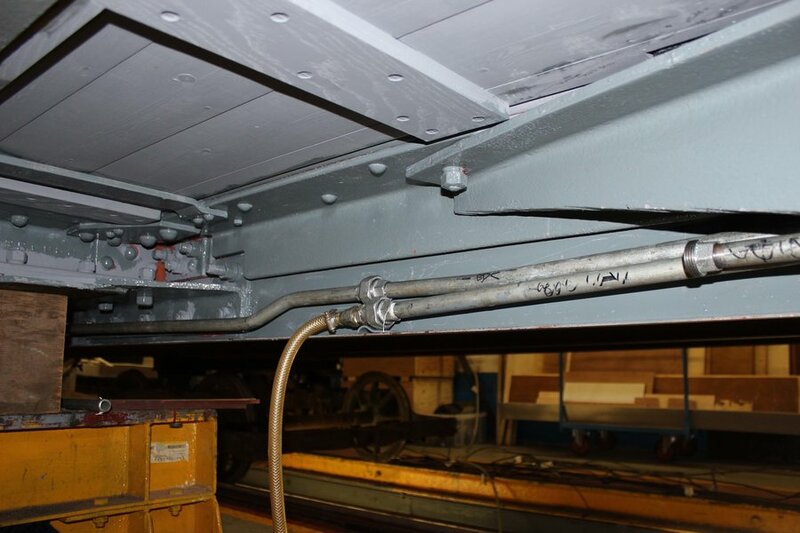 The photo shows the temporary supply of air from the workshop system (pipe coming up from the bottom of the image), connected to the metal pipes of the tramcar. 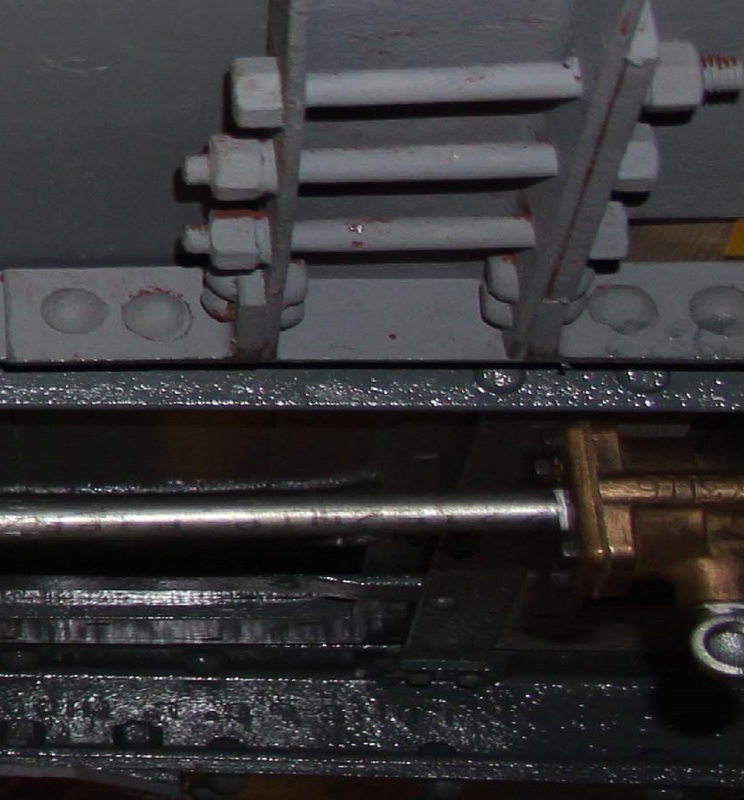 The small bronze object on the right of the photo, is a quick release valve (QVR) that the tramcar has. When releasing the brakes, instead of the air having to exhaust all of the system, the QVR is positioned near the brake cylinder so that only the air in the system between the QVR and the brake cylinder is exhausted through the QVR allowing the brakes to release much quicker. 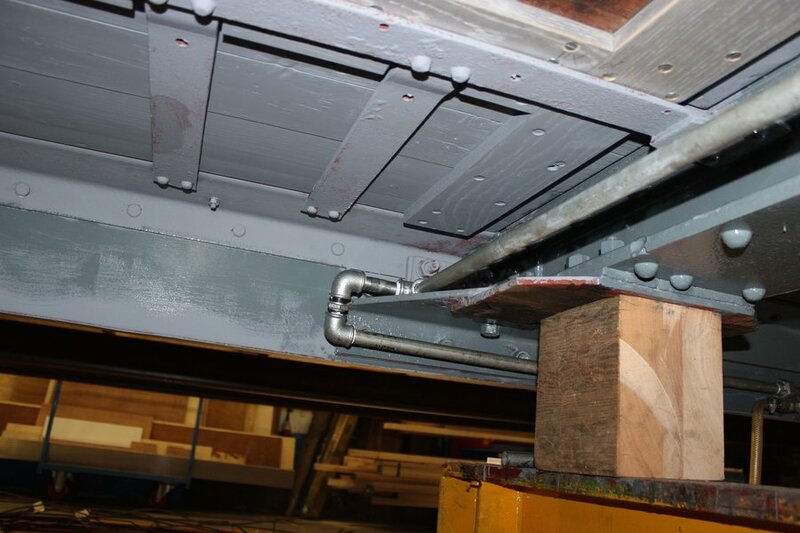 The photo shows some of the pipework in place under the lower saloon. There are another three pipes to be installed in this area. The bends in the pipes are to clear parts of the body structure and also the bogies as they swing round when the tramcar goes round curves in the tracks. 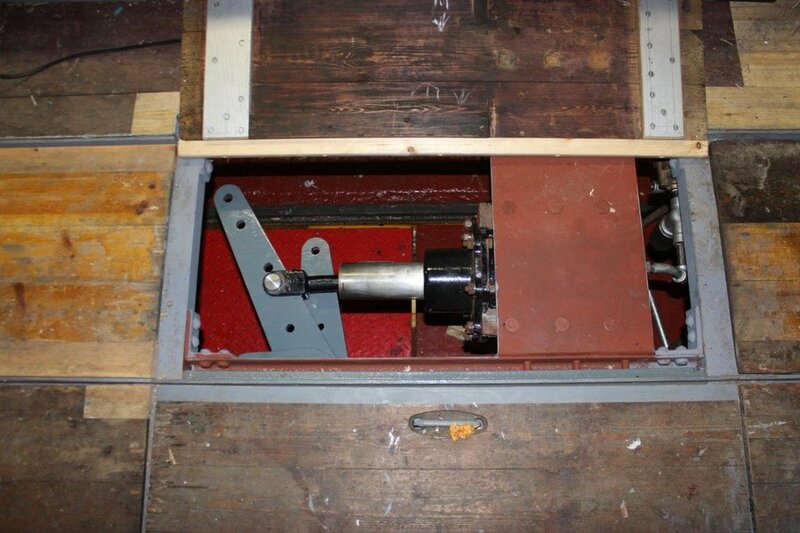 This is the air wheel brake cylinder, photographed in operation for the 1st time in over 50 years. These initial tests with parts of the pipework and valves, were really encouraging. A little bit of a sticky valve on the top of the north controller, and a slight leak on the rear brake cylinder, were the only small issues discovered whilst testing, and will be resolved as we carry on fitting the rest of the system and carry on testing. Don’t forget if you are visiting the Museum, you can see the latest progress with the restoration project by visiting the Workshop Viewing Gallery, where you can look down into our Conservation Workshop and chat with our workshop staff and volunteers.